When you visit Deacon Kerry’s Corner you will find a little story about an eagle that thinks it is a chicken (Homily for Sixth Sundy of Ordinary Time). 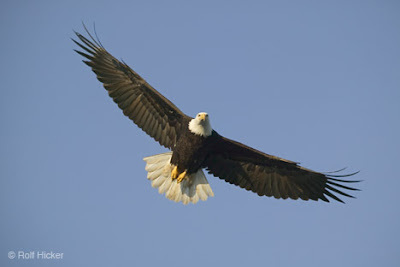 One day it sees an eagle soaring high in the heavens and is absolutely thrilled, and filled with awe and inspiration. It asks an older chicken what kind of bird it sees. This is the depressing reply:“That’s an eagle,” said the older chicken. I encourage all of you to read Deacon Kerry’s homily , as we begin lent, and the journey toward Easter. And, I think you will probably be like me and identify with the poor little eagle with shattered dreams. Dreams that need to be rejuvenated and believed in again. Our world repeatedly tells us that we need to be realistic. Eternal life is just the wishful thinking of doomed mortal humans. Our faith, however, reminds us that we are made in the ‘image and likeness of God’ and that “there are many rooms in our Father’s house,” and Jesus has one prepared for each of us. And, Pope Benedict XVI reminds us in his lenten message (2007) that God craves and yearns for our love because we were created by God (love) for God (love). Lent is a time to meditate on Jesus crucified, and to ask the question: Why? The answer is quite simple: Love!! !